'LES CHEVAUX, a late night drawing extravaganza,' hosted by The Keyhole Sessions, a Rogue Nuit Blanche event! 'LES CHEVAUX, a late night drawing extravaganza,' hosted by The Keyhole Sessions was an awesome Rogue Nuit Blanche event! The offerings, incredible. Outfits, poses, the whole set-up, pure brilliance of the dear Madame, Sonia Barnett. There was not a lot of time to pick and draw one of 5 or 6 ongoing poses, each with one or two models, since they changed every 15 minutes or so. I brought a whack of art supplies with me for this session. First I did a quick charcoal sketch; then I broke out my large set of water-soluble oil pastels and scribbled in colour; finally, I wet a brush and slid it over the figures so their lines turned into paint. I like to show 'the morning after, as is.' If I manage to further work on these, of course I will also post those whenever that happens (all my Keyhole life drawings are in a Picasa album). Nuit Blanche in Toronto Tonight! 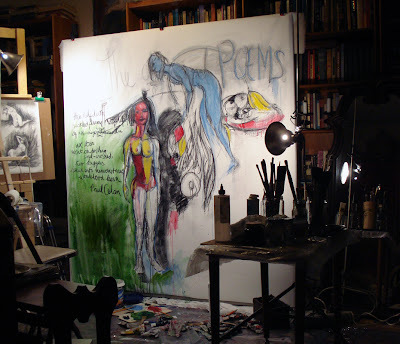 Charcoal Poems, in-process, 2012, 5' x 5', willow charcoal, oils on double primed canvas. And I was listening to Schönberg's 'Concerto for Piano and Orchestra, Op. 42,' Glen Gould piano, at high volume. My upstairs neighbour may have been banging on the floor, I'm not sure. After I sprayed the fixative on the charcoal, I opened the windows, and then didn't hear anything except outside sounds. I promise to get a better camera. I can't believe how much my mother's recent death is affecting me. Ok, so my 'influences' are Marc Chagall, Frida Kahlo, and Jean-Michel Basquiat (who I am truly into). 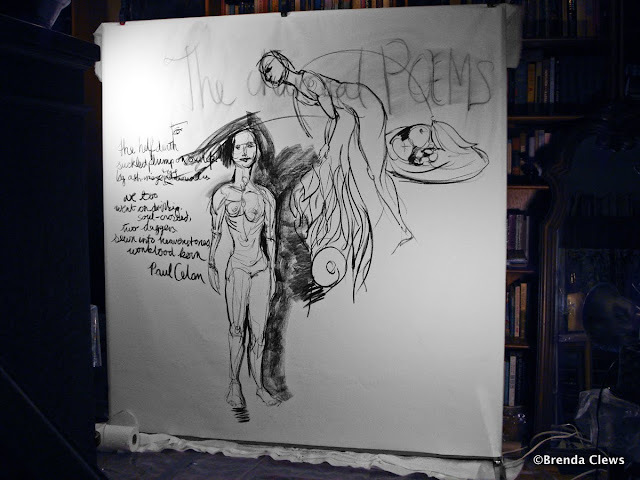 Charcoal Poems, in-process-detail, Brenda Clews, 2012, 5' x 5', willow charcoal, oils on double primed canvas. Sun shone into the living room, so the lighting was better than the photo I took last night. Unfortunately, I wasn't able to get an evenly lit photo of the whole painting due to its angle, the size of my space, and so on. A part of me wants to leave it as part drawing, with lots of blank canvas, but we'll see what happens as I continue working on it. The Charcoal Paintings, in-process -a detail, 5' x 5', willow charcoal, oils, on double primed canvas. When you don't know where to begin, begin where you are. Continuing with my remembrance of my years doing a degree in Fine Arts in the 1970s, and finding myself in the middle of a Conceptual Art era in which I did not belong, I suddenly made the connection with an old painting of mine and Frank Stella's famous stripes. Now I like Frank Stella as a person, - what I have heard of him in interviews (a recent Frank Stella interview with Eleanor Wachtel is brilliant), and his views as espoused in articles I've read over the years. His stripes paintings (what I knew as an art student), however, leave me on the cold side. They are certainly outstanding for their time. It's self-confident work, sure of itself. All the stripes are hand-painted (pencil lines but no tape) too. But do these works of Stella's inspire me, inspire the poetry in me? No, rather, these paintings remind me of good geometry, bordering on an Op Art. Fun, a little play with the way the eye reads its optical images. Still not ready to write of this past week, her death, her cremation, the ways in which it was a blessing and the ways in which it was a trauma. But I've been thinking of this photo, and, piling through dusty photo albums on bookshelves and then in the basement, finally found it. Taken on Adderley Street in Cape Town. I was 23 months old. I fed the birds out back this morning for my mother. With a half bread-bag of collected bread, it seemed a simple enough offering to one of the good memories. Keesha, my dog, was on a leash, and while she wanted to eat all the crusts, easily accepted being pulled away from the pile. Our kitten always accompanies us on the dog stops by riding on my shoulder, held gently but firmly under my hand, but she was only looking for whatever moves, people, squirrels, birds, falling leaves. Later I watched from the window as the pigeons came, feasted. My mother died last Thursday, September 13th; the funeral is tomorrow, though it hardly that, she was 89, and outlived all of her siblings and friends, so we will only have an immediate family gathering around her casket before it goes into the crematory fires. I seem to have been in deep meditation since she passed away. It was a good death, coming as a release after years of gradual decline and being fully bedridden after her stroke 6 months ago. She passed away peacefully. I wrote this in a Facebook post at 12:28pm on my way to the nursing home where she had lived out her last months of life. She died before noon; I was the first family member that the nursing home was able to get in touch with. It was a 10 minute walk through beautiful Annex streets in Toronto. I met my younger brother, Allan, outside the nursing home, and we went in together. A Keyhole Life Drawing Session last night. The Keyhole is still working through the Seven Deadly Sins, and last night was Envy. These are all charcoal on 18" x 24" sheets of 90lb archival paper, or, in the last of the one of three models, pencil on primed canvas. I have no idea how this is going to work. Still have to put some daylight bulbs in. The carpet is covered in thick plastic mats, taped down. Will my kitten climb that 5' x 5' canvas? - she scampered up and down the panel when it was a room divider. I had set up a portable studio in my daughter's room, but need something more permanent. This corner of the living room is only what we walked through. It wasn't used space. Stuff got stacked there, canvases (now stored behind the large one), dog kennel, etc. It makes my living room look quite junky, but then, I am mostly a recluse, and hardly have visitors, so what am I worrying about? A bit far from the windows, but the late afternoon sun certainly sweeps into those corners.